Plus my personal story from rock bottom back to health! Hello friends, I need to share my amazing journey with you. Up until about 5 to 6 years ago, I was a very busy interior designer in So. Calif. running my own business for over 28 years. About the time I turned 47 I started to have some health problems and all the Doctors I saw just weren’t listening to me! Over and over I kept hearing “you’re in menopause, low blood sugar, vitamin diffidently, fibromyalgia”, and a host of other stuff, but nothing they did to help any of these symptoms helped! I was however actually in menopause so that was the one correct diagnosis, but they kept blaming all my symptoms on this one issue. Over the next six or seven years, things just kept going downhill faster and faster until at the age of 55, after many different tests had been done without any diagnosis, I finally reached my breaking point working in the heat of August 2013. This hot summer day I can only explain it like I just crashed! I couldn’t, think, see very well, my speech was slow and slurred, my balance was way off, and I was so fatigued it was all I could do to get up to use the bathroom. Finally, a neurologist diagnosed me with MS and I was in a current MS episode (which was causing more scars in my brain). I had been having episodes that were causing scarring and damage for years during the time they thought it was just hot flashes from menopause. My husband later took me to an MS specialist he knew to work on getting me well again. The next year would turn out to be the worst of my life health wise and with the emotional stress that comes from people you love going through tremendous adversity. With the ending of menopause and being in an MS relapse with all the added stress, I felt I felt I aged and looked to me to be about 20 years older! This only made things worse and I gained weight which added to my declining appearance! I felt like hiding and never showing my face again. This was my all time low! Thank God I had a relationship with Him that got me through this hard time. I am a believer, and My God was and is faithful to bring me through anything! I would be nothing without Him. I don’t want to offend anyone with a different belief, I just need to share my story with you all truthfully. His never failing love, grace, faithfulness, and strength are what guide my life and get me through each and every day. 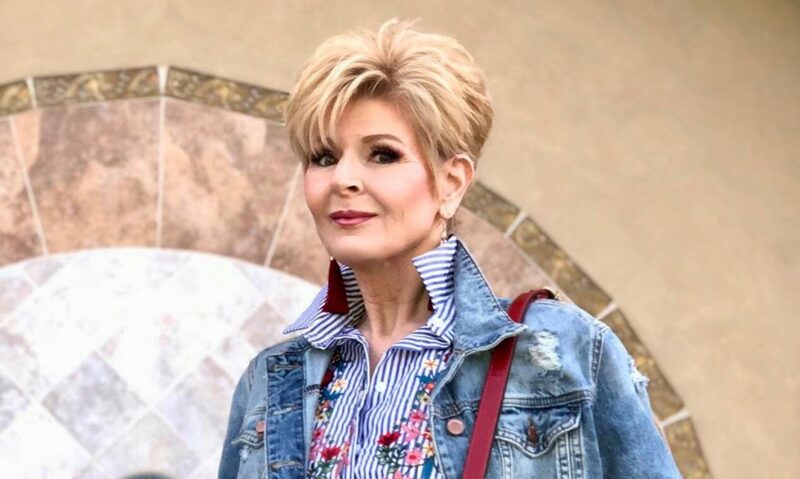 Then a wonderful friend and previous design client who owns her own beauty spa in Riverside Calif. “Fun By Michelle” came to the rescue with all kinds of nonsurgical answers, treatments, and skincare. She is a Physician’s Assistant and an Aesthetician. I started my journey back with some sublative laser peels and ZO skin care and a Clarisonic device. I then worked on getting rid of an extra 18 pounds. Michelle has done intensive laser treatment with blood plasma to rejuvenate my collagen production, then some Kybella injections under the chin, a little Botox, and some Fillers. I see her about 6 times a year to do little things to keep things headed in the right direction, along with using really good medical grade skincare. She got me back to looking more like my old self in no time! If you have been discouraged and felt like giving up, don’t! You can fight this fight against aging without surgery! Never give up! You are worth it. If you look better, you feel better about yourself, and if you feel better about yourself you are better you to the people around you. I hope my story helps just one of you! Thank you, please I would love for you to subscribe so you don’t miss anything. Thank you, Michelle, for taking 10 to 15 years back off again! Thank you, Rosemary, What a sweet thing to say. You made my day!